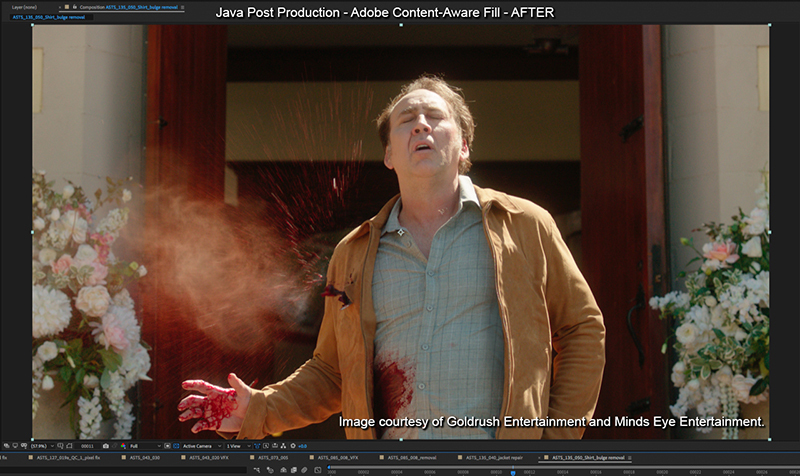 Video software giant Adobe selected Jack Tunnicliffe of Java Post Production to beta test its latest VFX software, Content-Aware Fill in Adobe After Effects. 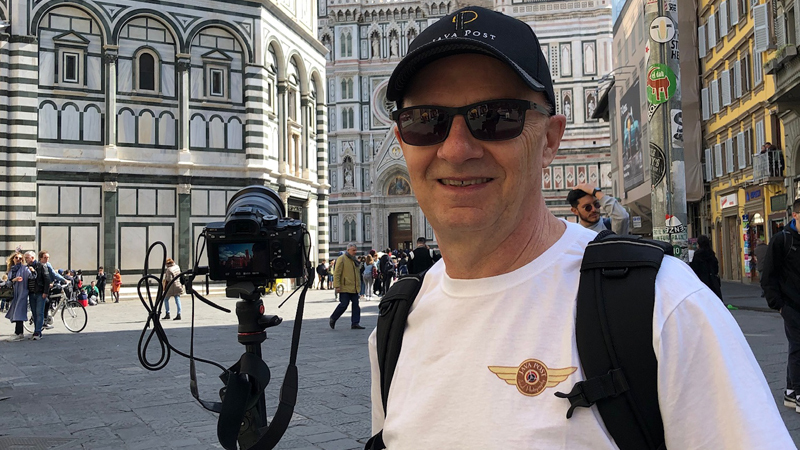 Jack has been an After Effects user for many years, and has been selected to beta test quite a few Adobe software products in the past. 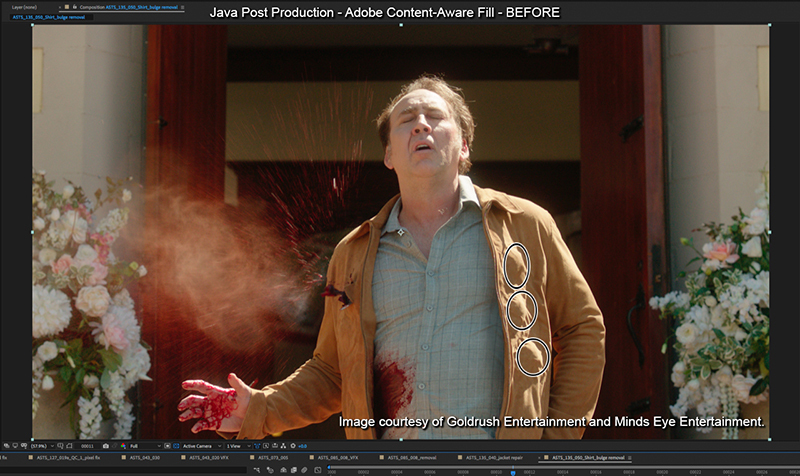 In this feature article from the Adobe Blog, Jack explains how Java Post Production is using Content-Aware Fill to make invisible VFX repairs to video productions, including the upcoming feature action-thriller, A Score to Settle, starring Nicholas Cage and Benjamin Bratt. 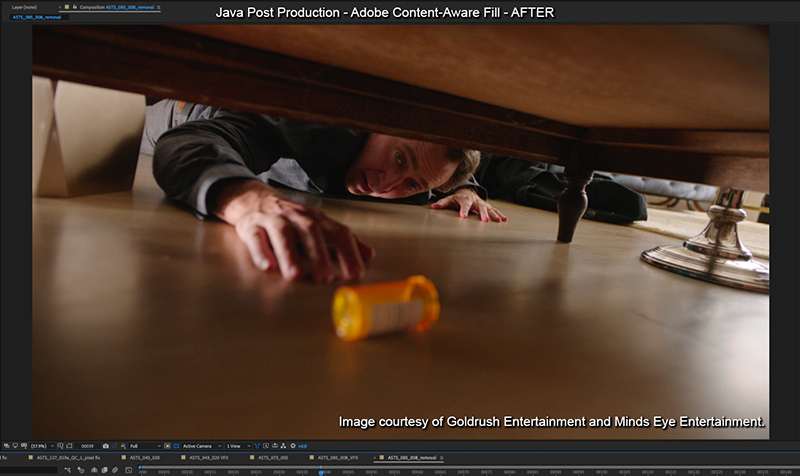 Java Post Adds to its Invisible Effects Toolbox with Content-Aware Fill in Adobe After Effects - by Michelle Gallina, Adobe Blog. 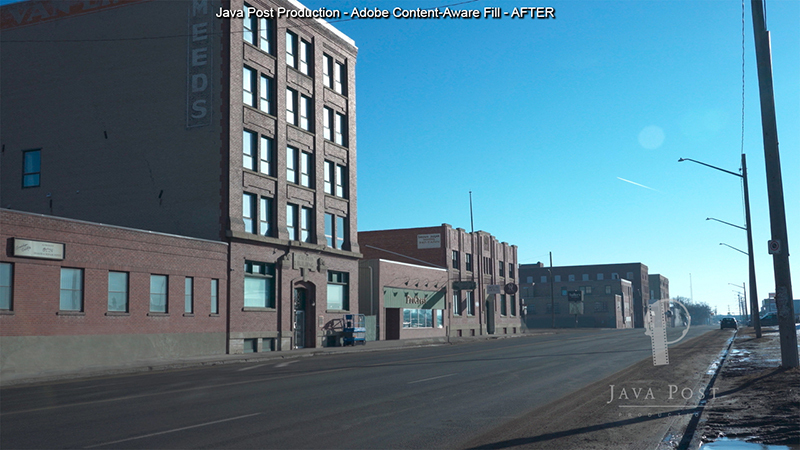 With Content-Aware Fill, the dream of easily painting or cloning out items is now a reality. 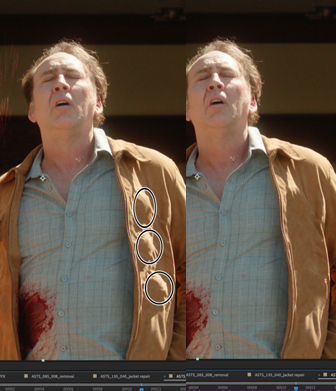 One scene in A Score to Settle uses squibs, which are miniature explosive devices, to simulate Nicholas Cage being shot. In the original scene, the squibs were visible under his jacket—especially when the sun reflected off them. To fix the shot, Jack created a reference frame in Photoshop of the jacket with the bulges removed. 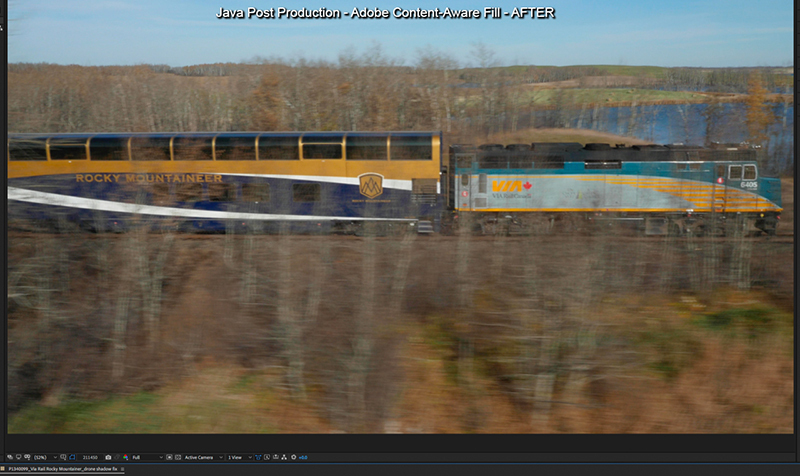 He then brought the frame back into After Effects and ran Content-Aware Fill, which adjusted the other frames to match. Jack also discovered that Content-Aware Fill can save the day if a movie is rejected during the QC process at lab. This can happen when a camera hasn’t been black shaded properly or has dead pixels. 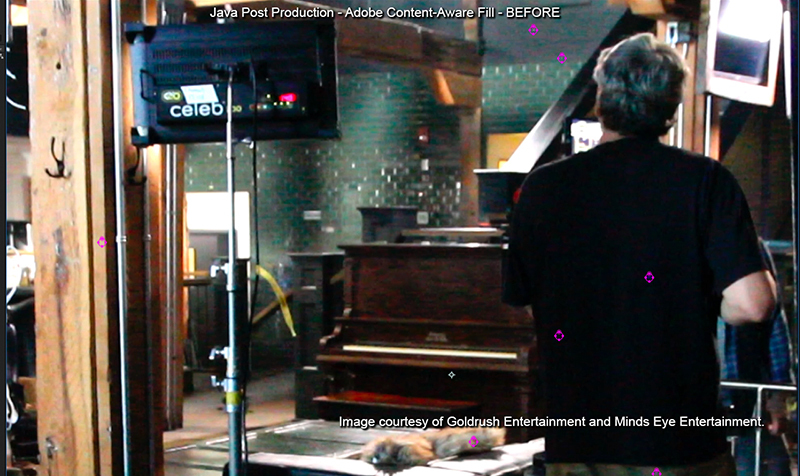 These pixels, which are visible on the big screen, can be invisible during post production. By putting a mask around the region where the pixels exist and running Content-Aware Fill, Jack easily filled in spots with information from surrounding pixels. Article by Michelle Gallina, Adobe Blog. 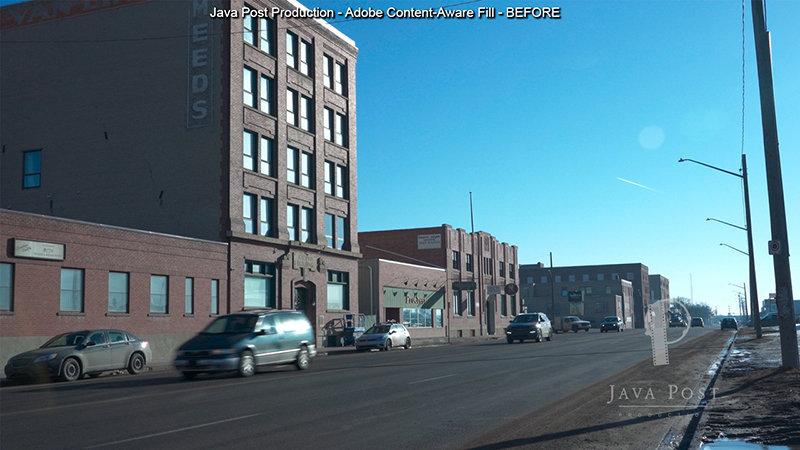 In the test seen here, Java Post used Content-Aware Fill in After Effects to remove cars (parked and moving) from camera footage. CLICK HERE to see video. This process can also be used to remove drone shadows from aerial footage, as shown in the before and after images below. 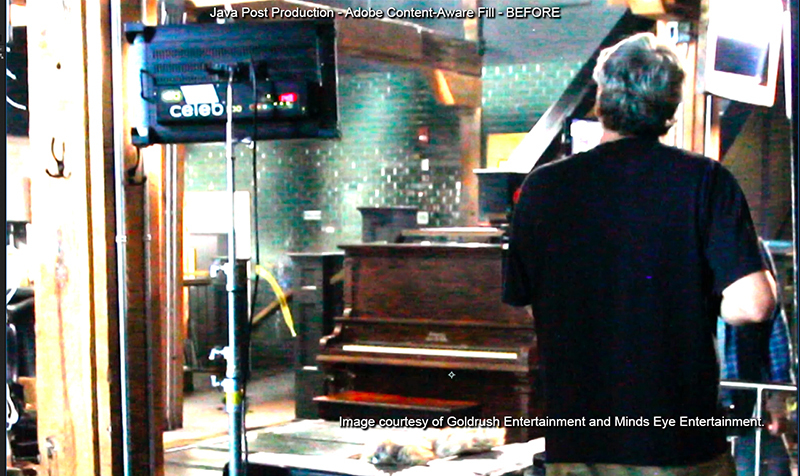 To see more examples of work done by Java Post Production, CLICK HERE.